Kevin Truong’s “The Gay Men Project,” as written about previously, catalogs the spectrum of the homosexual male experience. From the WASP-y creative director to the broke-looking college student, and every shape, color and one in between, the project showcases the gay gamut and exemplifies its banality. Tonight, the project’s first gallery showing debuted at the Pratt Institute’s Photography Gallery in the ARC building in Brooklyn, N.Y., and is on display through the end of the week. 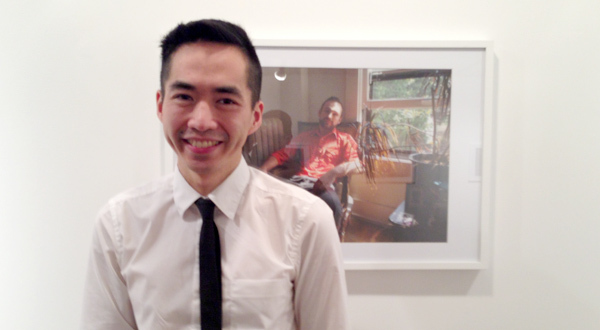 The collection, entitled “l’homme: an exhibition of photographs by Kevin Truong,” looks at the idea of home and personal experience. Its subjects include choice men from TGMP, along with some still-life interiors and atmospheric exteriors, most notably an abandoned barn with a autumnally-naked tree in the background seemingly growing out the chimney and every broken crevice. As standalone pieces, the works capture the breath — a single moment — of their subjects, underscoring the raw humanity and naturalness of the exposition. But as a culmination, the works tell a wonderful story of both home and homme. Beginning with a row of houses, a black trash bag or birds’ nest seemingly thrashes, caught in a tree. We’re framed in a sense of place — structural archetype that begins our journey. The next photo is an elderly man snuggling his cat, and is that cat all he has? The portraits continue a mostly uninterrupted conjecture of jolted scenery — a zig-zagged doorway, askew pots and pans — and looks at gay men — a solemn expression, a fading into wallpaper. It’s as if we’re in a zoo, walking between panes of Plexiglas with us on one side and Truong’s subjects on the other. “l’homme” is on display Tuesday through Friday, February 4 – 8, between 12 and 5 p.m. and by appointment. 200 Willoughby Ave., Brooklyn, NY 11205. 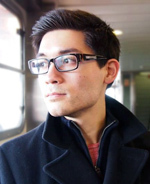 Justin McCraw Exploring Asian-American Culture Witnessing a lack of Asian-American content in mainstream media, Justin founded Dumpling as a launch board for Asian-American ideas. He enjoys Web development, magazines, cooking and his dog, Dino.